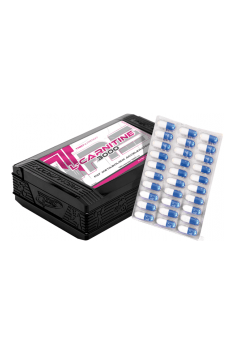 Trec L-Carnitine 3000 is a dietary supplement in capsules containing L-carnitine tartrate, which is a combination of tartrate and L-carnitine, a molecule that aims to increase the bioavailability of L-carnitine. Monopreparations or products containing L-carnitine in their composition are used in the support of physical exertion and as an element which improves the body's ability to reduce body fat. When the body needs the energy, one of the possible options is to use the accumulated deposits of body fat. Under the influence of appropriate factors, lipolysis occurs and fatty acids are released into the bloodstream. The cellular center responsible for their oxidation are the mitochondria. For free fatty acids to be β-oxidised, it is required to transport them from the cytosol through mitochondrial membranes. The medium that allows fatty acids to reach the mitochondrial matrix is L-carnitine. Circumstances in which L-carnitine deficiencies are observed include the majority of cases of malnutrition, including those caused by weight loss, and situations related to the use of elimination diets, in which the main source of food are plant products. It is good to know that the thermal processing of food reduces the available amount of L-carnitine in normal food. In addition, the demand for L-carnitine increases as a result of the intense physical exercise, regardless of whether it is a workout or doing other work. L-carnitine proves to be useful during sports training, because thanks to its properties it increases the energy capacity of the body, allowing it to generate more fuel that enables long-term training. It is believed that L-carnitine supplementation before training allows you to increase endurance and delay the fatigue. The use of L-carnitine does not only mean supporting physical effort. As a dietary supplement taken by overweight or slimming people, it can support effective fat loss. It should be noted that L-carnitine will work only when the user performs regular physical activity. People practicing sports require an additional amount of L-carnitine for the mitochondrial transport of fatty acids, which are used for energy production. In addition, it has been observed that regular intake of L-carnitine contributes to reduction of triglyceride levels and general improvement of lipid profile parameters. As a result, it can provide additional protection for obese people against an increased risk of heart and cardiovascular disease. To sum up, Trec L-Carnitine 3000 is a dietary supplement, the intake of which is recommended not only to people practicing physical activity in the form of recreation, but also to all those who are tend to gain weight and every slimming one. The indication for L-carnitine supplementation is also the use of a diet low in red meat. Take 3 portions (1 portion = 1 capsule) a day, preferably 30 minutes before main meals or training. Take 3 portions (1 portion = 1 capsule) a day, preferably 30 minutes before main meals. L-carnitine should be taken in the morning on an empty stomach and / or about 0.5-1 hours before the planned physical exertion. Due to the limited absorption capacity of the body, oral L-carnitine supplementation in single doses exceeding 2g does not bring much effect. L-carnitine reaches its maximum concentration in the blood approximately 3.5 hours after the oral dose and slowly decreases, with a half-life of approximately 15 hours. The best option is to take 2 or 3 doses of L-carnitine per day, at the regular intervals. Capsule shell (gelatin, color agents - titanium dioxide, patent blue V); anti-caking agent - magnesium salts of fatty acids.